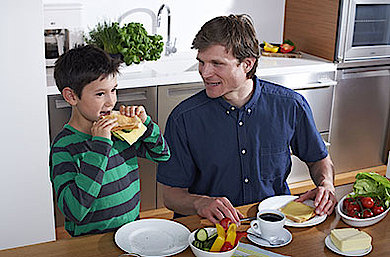 Oldenburger milk is not only a delicious drink but also gives a high nutritional value to the whole family. Milk is a proven source of calcium which is very important for the health and growth of bones. So especially for kids milk is an important supplement in a healthy diet. Furthermore, milk contains high-value protein and magnesium so that 500ml of milk already provide a precious contribution to a nutritious daily diet. This goes for all dairy products, e.g. cheese contains even more calcium than milk. In Western diets dairy products deliver around 20% of the daily energy intake and thus support strongly the performance in daily life. The easiest way to enjoy milk is to have it as a nutritious drink. In the morning or during the day it gives you energy while as a warm drink in the evening it is helpful for relaxation and soothing nerves. 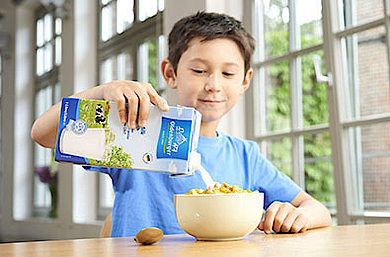 Furthermore, milk goes in perfect combination with crunchy cereals and fruits. This gives you the energy you need for a perfect start in the day or as a nutritious snack in between. 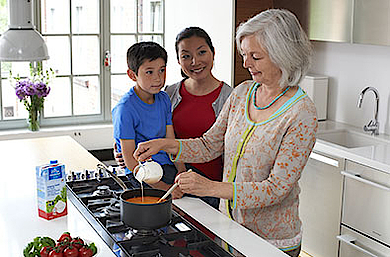 Milk is also a great kitchen helper, e.g. the dough for pancakes needs milk to prepare a delicious and nourishing meal. And not to forget to have milk in coffee. Be it a cappuccino or a normal coffee, Oldenburger milk gives the right smooth flavour and colour to it. To turn milk into cheese it needs starter cultures and rennet. Rennet is an enzyme which makes curdled milk with a thick texture. This mass is cut into small grains and formed into the desired cheese shape. The young cheese is stored in a salt bath which gives taste and hinders early spoilage. After that it is let to rest for the final ripening for several weeks which gives it a smooth texture and aromatic taste. Depending on the type of starter cultures and time of ripening the type of cheese and its flavour is defined. Cheese is eaten on bread but is also ideal as a snack both, pure or together with grapes, tomatoes etc. Furthermore it can be used as a topping for pizzas or casseroles. Oldenburger butter is made out of 100% pure cow’s milk. The raw milk entering the dairy is separated into skim milk and cream. The cream is then buttered, i.e. whipped so that the butter granules separate from the buttermilk. The butter granules are then mixed with starter cultures and kneaded to smooth butter. Butter forms the basis of many traditional dishes and is unrivalled in its versatile usage. It is part of the most delicious cakes and pastries. Butter has the capacity to enhance the flavour of both, sweet and savoury food. Furthermore it serves as kitchen assistant when frying e.g. potatoes or meat. But not to forget to use butter as a spread on bread. 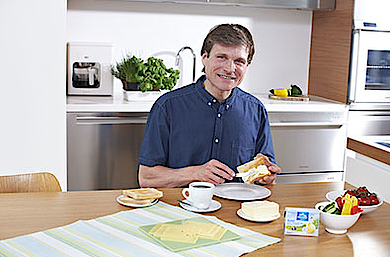 To make the delicious Oldenburger yoghurt fresh milk is combined with acidification cultures. These cultures convert part of the lactose into lactic acid. The lactic acid in turn makes curdled milk and give the product a more viscous texture. Yoghurt can then be eaten pure with a light sour taste or also with several different flavours of fruits, nuts or chocolate. Yoghurt serves as a light snack or can be a delicious dessert after a meal. Especially the plain version is an ideal combination with fresh fruit and cereal. As every dairy product yoghurt serves as a nutritious source of calcium and protein. At the dairy raw milk is tested for its safety and then separated into skim milk and cream. The cream is then adjusted to the desired fat content and designated use. Cream is an all-round talent in both, the sweet and savoury cooking and baking. Creams with higher fat content (e.g. 30-35%) are mostly used as whipped creams for fancy cakes or desserts. Additionally they can also be used in cooking for sauces or gratins. Furthermore there are creams with lower fat content, mostly between 10-20%. These are not suitable for whipping but are used in hot or cold meals for refining and seasoning or also as a coffee whitener. Milk is one of the healthiest groceries around but also a slightly demanding one. All Oldenburger products are treated gently with ultra-high temperature. That means that germs have been eliminated before the products are packed and shipped to the consumers. 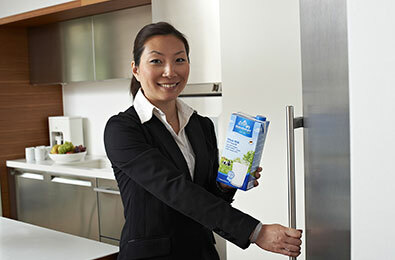 The UHT treatment also enables a long storage of dairy products without refrigeration. However, once the packaging is open, the air can transmit germs into the product which accelerate its durability. This means that the products cannot be stored ambient anymore but need cooling between 4-8°C. Once opened a dairy product needs to be consumed within 3-4 days.